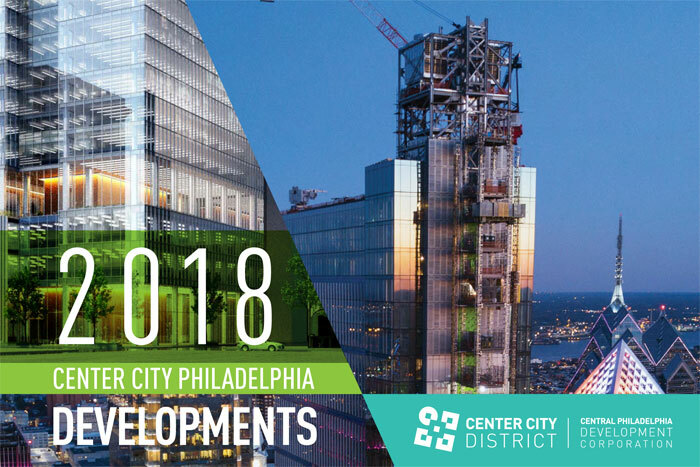 As a special supplement to the annual State of Center City report, Central Philadelphia Development Corporation (CPDC)/Center City District (CCD) has released Center City Philadelphia Developments: 2018, an in-depth report on current and upcoming major projects in Center City. This report includes a map and full-color photos or renderings and project descriptions of all 69 major developments in Center City Philadelphia, categorized by type. The report highlights major projects that were completed in 2017, were under construction, or had been announced as of the end of Q4 2017. Information on the various projects comes from published reports and Civic Design Review applications and entries were verified with the developers and/or architects of the projects. All data reflect project status, design, and information available to the public as of the end of Q4 2017.